Pakistan floods appeal: why the slow start? 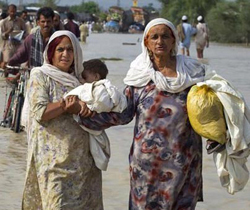 The humanitarian disaster caused by floods in Pakistan this summer was unprecedented in scale. Almost 21 million people were left without homes in the weeks immediately after the floods, according to estimates by the UN - a number that exceeded those affected by the Asian tsunami in 2004, the earthquake in Kashmir in 2005 and the 2010 earthquake in Haiti put together. 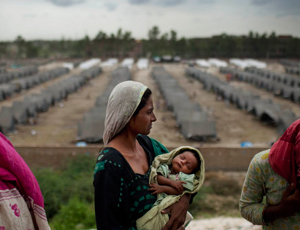 Millions needed urgent shelter, medical attention and supplies. Ban Ki-moon, the Secretary-General of the UN, described it as "one of the greatest tests of global solidarity in our times". The Disasters Emergency Committee's UK appeal raised just over £40m in the first month. But this was much less than it raised for those affected by the earthquake in Haiti only seven months earlier, which attracted £77m in the same number of weeks. Those raising funds to help people in Pakistan say they were faced with a unique and challenging set of circumstances that affected the way in which donors gave. These circumstances were hard to predict and came together to make the work of fundraisers difficult. 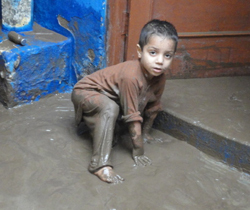 The flooding began on 29 July and was caused by heavy monsoon rains in the north-west of the country. Five days later, the DEC - the umbrella organisation for 13 aid agencies - launched its appeal. Brendan Gormley, chief executive of the DEC, says that giving was slow in the early days because of several factors. "With Haiti, the remorseless horror of the effects of a concentrated disaster on people in a capital city offered television viewers powerful images right from the start," he says. "Although there was some coverage immediately after the deluge, in Pakistan it was a challenge for news outlets to communicate the effects: all you do is look at a film of a lake." And in contrast with Haiti, says Gormley, the nature of the disaster meant the full effects on people took days to become clear to western journalists trying to cover the story. "It was a catastrophe worked out over weeks as the floods moved down across populated parts of Pakistan - not hours or days," he says. Aid agencies are reluctant to compare disasters, but some acknowledge that the floods in Pakistan presented another challenge: relatively few people died. The UN estimates that 1,700 people were killed, whereas 230,000 died in the Haitian earthquake. "The media tends to go with the number of deaths rather than the number of survivors when they first report a story, and it was a very low number in Pakistan," says Gormley. The time of year added to the challenge, he argues: the earthquake in Haiti happened in the middle of a cold, dark January when many people in the UK were at home watching TV reports. Pakistan's summer floods came when many were away on holiday or spending time outdoors. Schools are often the focus of fundraising efforts, but they were closed for the summer. Other charities experienced similar frustrations in the days immediately after the floods. World Vision, a DEC member charity, saw a similar pattern emerge with donations to its appeal for Pakistan, which raised £1m. "Events gathered pace over several days before spreading quickly and violently over subsequent weeks," says Matthew Neville, director of public engagement. Save the Children, another member of the DEC, also launched its own appeal, which raised £2.3m. Jeremie Bodin, head of emergency fundraising at the charity, says donations arrived more slowly than they had done for previous appeals. Like Gormley, he says fundraising was affected by the nature of the disaster. "The scale was unclear at the start," he says. "A disaster is usually a big event that causes a peak of media interest and brings an immediate peak of donations, which then tail off. But the Pakistan story changed and grew over three or four weeks." Donations to Save the Children's appeal made in the second, third and fourth week outstripped those of previous weeks as the story unfolded, he says. "People were coming back from their holidays, so by the first week in September we still had very high donations. That was unusual." As the fundraising effort continued, donations to the DEC appeal followed the same upward trend, which the organisation described as a unique and extraordinary pattern: £9.5m was received in the week after launch, £11.2m in week two and £19.3m in week three. Gormley says the trend "belied all talk of donor fatigue". Bodin says there is limited evidence that UK donors were reluctant to give. He points out that Save the Children's best response was from its warm supporters - those already on its database - and that those people gave similar amounts to the Pakistan and Haiti appeals. It might be tempting to conclude that the Pakistan appeal performed less well because UK donors are reluctant to donate to what they perceive to be a Muslim cause. But according to Islamic Relief, the only Muslim member charity of the DEC, the opposite was true. The charity expects generous support for its appeals from British Muslims as a matter of course, but its Pakistan appeal, which raised £11.5m, marked a departure in its fundraising. Jehangir Malik, the charity's UK director, says that for the first time the charity recorded a significant proportion of donations from non-Muslims in the UK. "There were a lot more from wider British society," he says. "Obviously we don't ask donors what religion they are - we can only go by names - but this was definitely a milestone for us." Malik attributes this in part to strong media coverage. Islamic Relief aid workers were interviewed on mainstream television news reports in the UK. He says the charity's affinity and deep links with Pakistan allowed it to punch above its weight in publicity terms. "There was an advantage for us over larger aid organisations because we enjoy a longer history in the country," he says. Three months after the floods began, the UK public has donated more than £60m to the DEC appeal for Pakistan, making it the umbrella group's third highest-grossing appeal. The DEC's appeal for Haiti raised £101m and the appeal for the 2004 Asian tsunami raised £390m. Gormley says the DEC will not draw conclusions about what motivates people to give to its appeals, but he concedes that the lesson from the Pakistan appeal is that there is a clear link between immediate and engaging news reporting by media organisations and how much money is raised. And he points out that although the appeal performed less well than the one the DEC ran for Haiti, ordinary British donors were more generous towards Pakistan than were many western governments. "Canada, Italy and Germany offered nothing to the UN's international relief effort," he says. "The British public shamed politicians across the world."